Jack’s Deli in Westlake has been around for quite a while, but I’d never been there. I’d only heard the mixed review from friends and acquaintances. At least until last week, when I had two reliable sources tell me that Jack’s has two things that I love, good breakfast and a nice Monte Cristo. For those of you who don’t know, the Monte Cristo is the king of sandwiches. You might have thought pastrami would have the crown, or perhaps the philly cheesesteak, or anything not from subway. But you’d be wrong. The Monte Cristo is a triple-decker ham, turkey and swiss sandwich, which is dipped in egg batter, fried a golden brown that would make Scrooge McDuck blush, lovingly dusted in powdered sugar and served with a side of raspberry jam. In essence, it is breakfast, lunch, dinner and dessert all rolled into one. Worth the heart attack? Um, Hell Yes! Now, that’s what a monte cristo should be, and I’m happy to report that is pretty much what Jack’s gave me. I ate there this afternoon with five of my fellow coworkers under the guise of a “team-building exercise.” This was merely a clever ruse on my part to get everyone together so I could give Jack’s a shot. Maybe it wasn’t so clever after all, since everyone seemed to know how full of crap I was from the second I suggested the lunch. Thanks for coming anyway, guys. Jack’s Deli – At Westlake Blvd and Townsgate near Natural Cafe. My boss was actually the one who tipped me off to the monte cristo, but I was looking to have some breakfast. What we ended up doing was ordering the monte cristo and a breakfast dish called the chorizo jack and then splitting them so I could try both. Before I get to that though, I want to take a moment to tell you why you might want to try Jack’s too. First, it’s been there forever. The owner is actually the son of a chef who worked at the famous Brown Derby in Hollywood. Actually, the chef, himself, is pretty famous since he was credited with inventing the Cobb salad. Even Mikey and I, two guys who view salad eating as a particularly cruel and unusual punishment, have heard of that one. Aside from it’s pedigree, Jack’s also has some of the fairest prices that you’ll find in Westlake. That’s not to say they’re cheap (they’re not), but I find the breakfast prices to be a pretty good value for what you get. The service is cordial and attentive, but not overly so, which I definitely can appreciate. For the most part, they just serve you the food, which I thought was pretty darn good. The monte cristo was not too huge. It was actually the perfect size for a sandwich that is so rich. The main appeal of the sandwich is the mix of sweet and savory. The ham and turkey provide the protein, but the bread, cheese and frying process are the driving forces behind the magic. 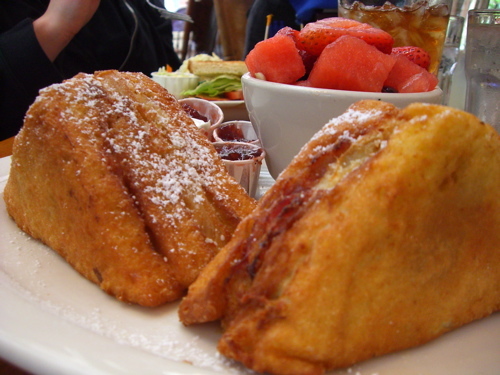 This particular monte cristo was fried perfectly. It was probably the only one I’ve ever had that didn’t fall apart. At all. There could have been a little more powdered sugar on it and I really wish that they would have served the jam in something other than the equivalent of a paper thimble, but the sandwich itself was done right. My favorite aspect was actually the thin, golden crust that was the first indication that I had achieved sandwich nirvana. The chorizo jack was also very good. It was had the consistency of an omelette, but with plenty of cheese and chorizo woven in. It also had a slight casserole feel due to the fact that they bake tortilla chips into the dish and also pile them on top. The difference in textures from the crunchy chips to the gooey cheese and chorizo really made this dish something different from anything I’ve ever had for breakfast. 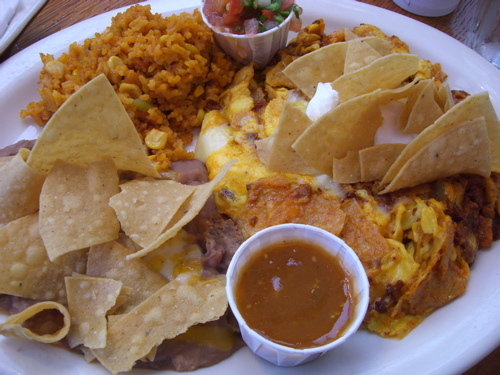 The salsas, that you see in the photo, were mildly spicy and yet full of flavor. I thought the reddish brown salsa was better, but my boss preferred the chunkier pico de gallo. They’re both pretty good considering this is a deli and not a mexican restaurant. I was also very impressed with the quality of the sides. Not so much the beans with the chorizo jack, but the spanish rice was tasty and the fresh fruit that came with the monte cristo tasted like it had just been cut. Most sides I eat get lost in the background and don’t add much to the meal. Occasionally, it’s nice to have some sides that actually make the meal better as opposed to merely justifying higher prices. Unfortunately, I wasn’t able to try the fish tacos, which had been requested in a review of Jack’s. I will do my best to make it back and file an update when I can. Overall, I was very happy with Jack’s and even happier that I found a place near Brent’s deli, so I never have to go back there again. The fact that this place is cooler and less expensive is just an added bonus. Plus Jack’s Deli loves EatMeCalifornia. They are following us on Twitter and you should too. And while you’re at it, stop in and grab a monte cristo at Jack’s and experience the sandwich as god intended it. I started following Jack’s on Twitter recently, too. I had completely forgotten about them before that. I went there a couple times when I used to work in Westlake, but haven’t been in probably 7 or 8 years. I, too, am glad to be reminded of an alternative to Brent’s, which my husband always suggests and which always manages to make me regret going there. I am definitely going to try that chorizo jack. i used to love jack’s for lunch until brent’s came to town. brian, i know your breakfast experience at brent’s was below satisfactory but you MUST try their corned beef reuben. it beats out every deli in the area. its so full of meat, i usually get 2 slices of rye to go so that i can have another sandwich the next day. jack’s does make good pancakes and chicken noodle soup though. recently i was in dire need of a mid-week hangover cure so my boss and i hit jack’s for lunch. i knew a nice bowl of chicken noodle soup would make me feel better but then we got there and i couldn’t decide between pancakes or soup. so what’s a girl to do? order the pancakes AND chix noodle soup, of course! it was a great lunch and my hangover had basically vanished by the time i got back to my desk.